at Tshophu Lake, Bhutan at 4,100 m (13,500 ft) elevation. The Himalayan marmot (Marmota himalayana) is a marmot species that inhabits alpine grasslands throughout the Himalayas and on the Tibetan Plateau. It is IUCN Red Listed as Least Concern because of its wide range and possibly large population. The Himalayan marmot is about the size of a large housecat. 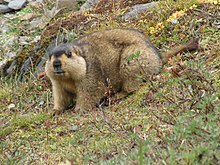 It is closely related to the woodchuck, the hoary marmot and the yellow-bellied marmot. It has a dark chocolate-brown coat with contrasting yellow patches on its face and chest. The Himalayan marmot occurs in the Himalayas at elevations of 3,500 to 5,200 m (11,500 to 17,100 ft). In China, it has been recorded in Xinjiang, Qinghai, Gansu, Xizang, western Sichuan and Yunnan provinces. The Himalayan marmot lives in colonies and excavates deep burrows that colony members share during hibernation. Burrows are between 2 and 10 m (6.6 and 32.8 ft) deep, given that the upper soil layer is sufficiently light and deep such as fluvioglacial, deluvial and alluvial deposits. Where soil conditions are ideal on alluvial terraces, marmot colonies comprise up to 30 families, with up to 10 families living in an area of 1 km (0.62 mi). The marmot eats plants growing on pastures, in particular the soft and juicy parts of grassy plant species like Carex, Agrostis, Deschampsia, Koeleria and flowering species like Euphrasia, Gentiana, Halenia, Polygonum, Primula, Ranunculus, Saussurea, Taraxacum Iris potaninii. Females become sexually mature at the age of two years. After one month of gestation they give birth to litters of two to 11 young. On the Tibetan plateau, marmot species form part of snow leopard prey. It was known to the ancient Greek writers as the gold-digging ant apparently as reference to the fact that gold chunks were mined from the silts of the burrows these marmots dug. The French ethnologist Michel Peissel claimed that the story of 'gold-digging ants' reported by the Greek historian Herodotus (5th century BC), was founded on the golden Himalayan marmot of the Deosai plateau and the habit of local tribes such as the Minaro to collect the gold dust excavated from their burrows. ^ a b Shrestha, T. (2016). "Marmota himalayana". The IUCN Red List of Threatened Species. IUCN. 2016: e.T12826A115106426. doi:10.2305/IUCN.UK.2016-3.RLTS.T12826A22258911.en. Retrieved 30 October 2018. ^ Thorington, R. W. Jr. and R. S. Hoffman. (2005). Family Sciuridae. Pp. 754–818 in D. E. Wilson and D. M. Reeder (eds.) Mammal Species of the World. A Taxonomic and Geographic Reference. Johns Hopkins University Press, Baltimore. ^ a b c Molur, S., Srinivasulu, C., Srinivasulu, B., Walker, S., Nameer, P.O. and Ravikumar, L. (2005). Status of non-volant small mammals: Conservation Assessment and Management Plan (C.A.M.P) workshop report. Zoo Outreach Organisation / CBSG-South Asia., Comibatore, India. ^ Smith, A.T. and Xie, Y. (2008). A Guide to the Mammals of China. Princeton University Press, Princeton, New Jersey. ^ Nikol’skii, A.A. & Ulak, A. (2006). "Key factors determining the ecological niche of the Himalayan marmot, Marmota himalayana Hodgson (1841)". Russian Journal of Ecology. 37 (1): 46−52. ^ Lyngdoh, S.; Shrotriya, S.; Goyal, S.P. ; Clements, H.; Hayward, M.W. & Habib, B. (2014). "Prey preferences of the snow leopard (Panthera uncia): regional diet specificity holds global significance for conservation". PLoS One. 9 (2): e88349. doi:10.1371/journal.pone.0088349. PMC 3922817. PMID 24533080. ^ Peissel, M. (1984). "The Ants' Gold: The Discovery of the Greek El Dorado in the Himalayas". Harvill Press. ISBN 978-0-00-272514-9. This page was last edited on 7 December 2018, at 01:33 (UTC).